According to the National Marine Life Center, dolphins move by pushing their powerful tail flukes up and down in the water. This tail movement pushes water back and propels the dolphin forward. To steer through the water, dolphins use their pectoral fins and their dorsal fins. Dolphins have two kinds of fins: the dorsal fin and pectoral fins. The tail fluke is used to move the dolphin forward, and the fins are used for steering. Pectoral fins help the dolphin steer, balance in the water and stop moving. They aren't used for forward movement, however. The dorsal fin, which is on top of the dolphin, acts as a stabilizer, like a rudder on a boat. Unlike the fins of fish, dolphin dorsal fins have no bones in them. Their fins are instead made up of dense, folded tissue that is rigid and allows the dolphin to stay upright and more easily cut through the water. 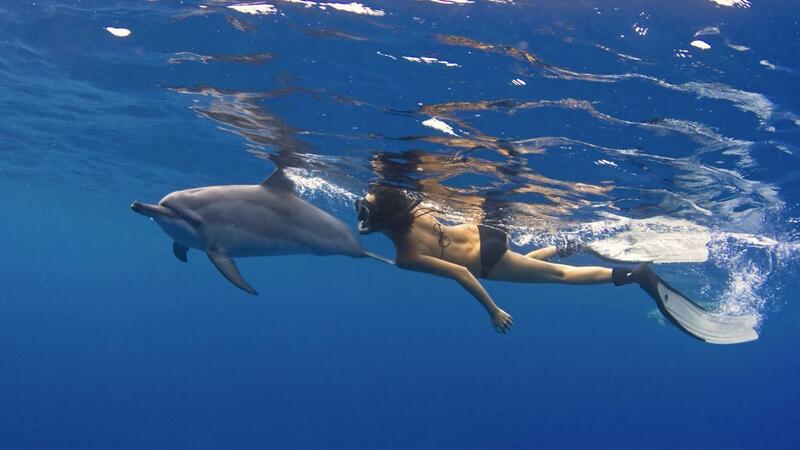 The dolphin's entire body is designed to sleekly pass through water. Dolphins have smooth, rubbery skin that is hairless and streamlined. Their skin is constantly sloughed off and replaced with new skin. Any appendages sticking out on the dolphin, like the fins, are all smooth and curved to give speed to the dolphin.